I’ve actually visited the Great Wall of China, but to my embarrassment, I never realised that it was built to keep out alien monsters. Set in 11th century China, this Chinese-American actioner sees a secret army do battle with said creatures, who awaken every 60 years. So every 60 years they have to have a massive war against an evil hoard of monsters. One wonders how they get anything done. Fortunately, a big white guy (Matt Damon) shows up and helps them thwart the aliens by confusing them with his unplaceable accent. This probably isn’t an area best served by Chinese director Zhang Yimou, who delivers where it counts: the spectacular action set pieces, boasting the impressive scale and epic quality that we’ve come to expect from the visionary behind House of Flying Daggers and Hero. The problem is that the most exciting of these battle sequences comes right at the start, and the film soon becomes the Great Wall of Boring. 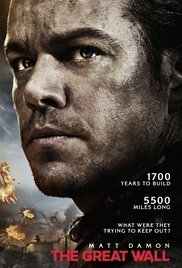 Matt Damon and Willem Dafoe are glaringly bad, though they have admittedly little to work with. There are 6 writers credited, and they can’t come up with an original idea or decent joke between them. With no good characters or story elements, this is flimsy, and only seems to last about 10 minutes as a result. It needs to be much crazier: something as simple as having more than one type of monster to fight might alleviate the noisy video game feeling of banging your head against a great big wall. Despite some dizzying aerial cinematography and colourful production design, it feels like we’ve seen this all before: siege scenes from The Lord of the Rings, creatures from Avatar and performances from Robin Hood: Prince of Thieves. You may not be able to see The Great Wall from space, but you’ll definitely be able to watch it on a plane.